We have all heard the warnings. But, for many of us sun-loving ladies (and men) out there, we are willing to take our chances. However, do you really know the risks? We can assume that we will all age one day and there’s nothing we can do about it but you can age much better by taking good care of yourself throughout your life. You will thank yourself later! What risks do you increase by heading outdoors without any protection? Overexposure to the sun will cause dark spots on the skin to appear along with little freckles and an overall uneven skin tone. That beautiful, even skin tone you have now will be a distant memory. Along with a change in the tone of your skin, you will also experience the destruction of the elastic and collagen tissue in the skin which serve the purpose of making your face look full and perky. As a result, you will see your skin begin to sag and will be more prone to having bags under your eyes. Not cute! Along with sags and bags, that loss of elastin fibers and collagen causes wrinkles to appear. The flexibility of the skin is reduced particularly around the neck and face. Besides the purely aesthetic consequences of sun exposure, you also face some more serious risks. Unfortunately the most common form of cancer in the U.S. is skin cancer which is often caused by damage from the sun. However, you can cut your risk of developing the most dangerous skin cancers in half by using one single product regularly and in adequate amounts. What crazy, miraculous product do you have to use? Why, it’s sunscreen of course! Exposure to UV radiation is very dangerous for our eyes as well. This is especially true for people with blue, or other lightly colored eyes. If they are exposed to too much UV radiation over a period of time, they are more disposed to cataracts, injury to the retina, and macular degeneration. It can also cause melanoma of the eye. At the end of the day, we can’t keep ourselves completely shielded from the sun. Being outdoors, in nature, swimming, boating or hiking—or even walking the dog—are important parts of what make for a happy and healthy life. The best way to enjoy the sun, however, is in a responsible way. 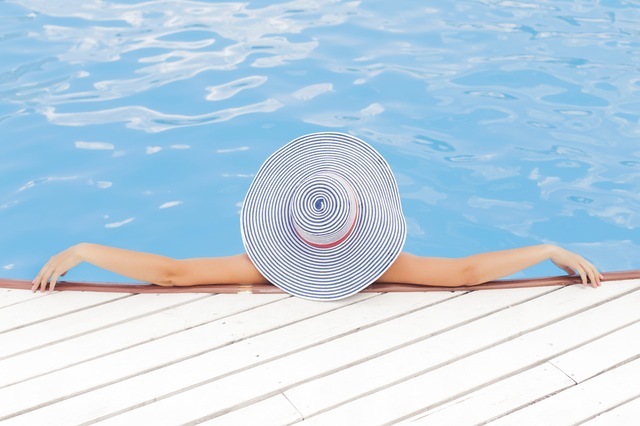 Wear hats and clothes that provide coverage, and apply and re-apply sunblock often so that you can enjoy a lifetime of healthy, great looking, happy skin.